*Note: This election was improved and updated by the Historical Scenario Commission on July 8, 2017 and on December 11, 2017. The first presidential election take place amid uncertainty and chaos. Domestically, the country is struggling economically, as a result of a long war with Britain that has left the country somewhat crippled in production and trade, especially when you consider the bulk of our trade had been with Britain. The present Articles of Confederation, which binds the former colonies, has proved to be ineffective in the case of emergencies and in competing with European power. As such, leading figures from each state had called a Convention in Philadelphia to amend the Articles of Confederation; however, the grand majority of delegates pushed for a stronger central government, resulting in a Constitution of the United States. One provision called for the election of a chief executive–the President of the United States. As the election year of 1788 arrives, the several states are in the process of ratification, but some states are on the fence in regards to the Constitution. The more “radical” politicians, such as Patrick Henry, Samuel Adams, Thomas Jefferson, and George Clinton have been left out of the process. However, with the support of Benjamin Franklin and George Washington, and the authors of the Federalist Papers–Madison, Hamilton, and Jay–ratification seems more than likely. In foreign affairs, a Revolution is brewing in France. While the possibility of a brother Republican is exciting, a revolution in France guarantees that trade with our new top trade partner and ally will greatly diminish, as the British are likely to block French trade. This contest was really one for the Vice Presidency, as General George Washington, who had been president of the Constitutional Convention, was expected to win a vote from each delegate. As required from the Constitution at the time, the delegates would have a second vote to select the Vice Presidency. As Washington was a Southerner without foreign affairs experience, a pro-Constitution Northerner with foreign affairs experience was likely to become the next VP. This left John Adams, the first minister to Great Britain, as the frontrunner for this spot, since Benjamin Franklin, at 82, was too old, and John Jay was likely too young at 42. Those opposed to the Constitution turned primarily to NY Governor George Clinton. 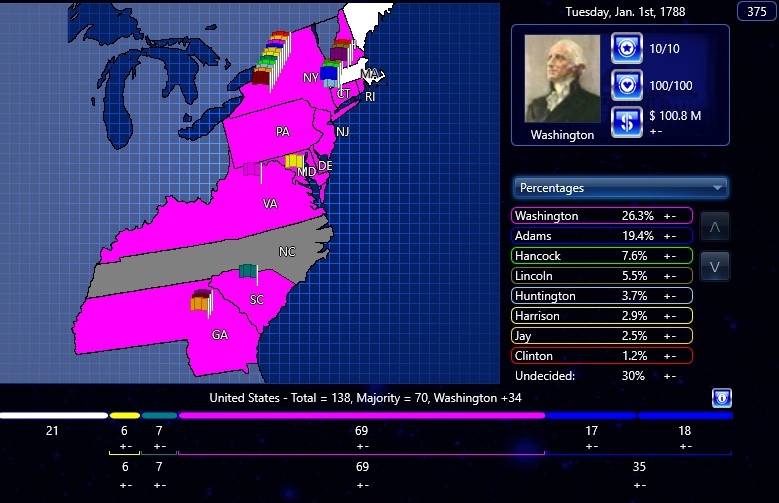 As expected George Washington won a vote from every elector. John Adams, who was likely to win, was able to secure victory, arguably by a larger margin than expected, as he won more votes than all the other VP-candidates combined. This is most likely because New York was too disorganized to send electors, which cut the feet from under a John Jay or George Clinton ticket. Some argue that Alexander Hamilton might have schemed to prevent Clinton, an anti-Federalist, from entering the government and destroying it from within, even at the expense of fellow NY Federalist John Jay. Why not try and disrupt the country’s attempt at federalization by joining the insurgency campaign of George Clinton? Why not pick John Jay and see if you can take the VP spot, even without your home state sending electors? Why not try and have the South lead the Early Republic by creating a Southern coalition to send John Rutledge to the vice presidency? Why not use John Hancock, the former president of the Continental Congress, and see if you can rest New England from fellow Massachusetts man John Adams, and take the vice presidency for yourself. 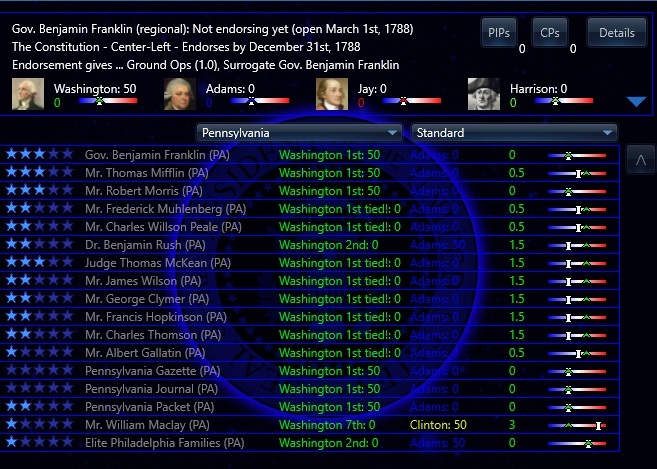 Why not see if you can win every elector as John Adams, tying George Washington, and send the election to the House? Why not “watch” the election as the Simulation Party to see how the CPU plays out the election? What if these candidates had ran? What if the primary Declaration author, Thomas Jefferson, a leading critic of a central government, ran for the vice presidency despite a Virginian likely to win the White House? What if popular general Artemas Ward ran? Is two generals too much for a presidential ticket? What if Samuel Adams tried to upset his cousin’s candidacy for VP? 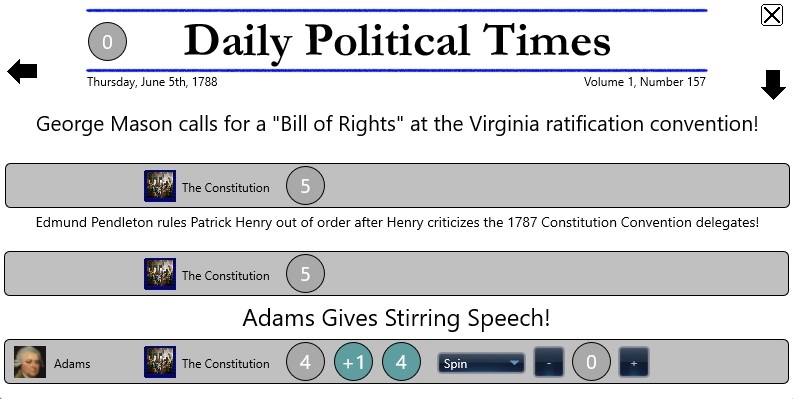 What if vehement critic of the Constitution, Patrick “Liberty or Death” Henry ran? What if Benjamin Franklin ran? While 82 years old, it is possible he could have ruined Washington’s chances at winning unanimously. What if James Madison, then 37, ran? Could the “Father of the Constitution” win? What if William Maclay, a rabid critic of a central government, had run as another anti-Federalist? What if Judge James Wilson, the only Constitutional delegate to call for a popular vote, had run? What if Common Sense author Thomas Paine had not migrated to Europe in 1787, but stayed to take part in the Early Republic? What if Henry Laurens, arguably the leading trafficker in slaves, had aim to take the vice presidency by creating a Southern Bloc? What if Richard Henry Lee, a critic of a Constitution, had run? What if ambitious general Horatio Gates had joined the race? What if the celebrated artist, naturalist, politician Charles Willson Peale had run? What if the “Father of the Bill of Rights” George Mason ran despite his provincial attitude and opposition to the Constitution? What if the only Founding Father to sign all four major documents of the United States–Continental Association, Declaration of Independence, Articles of Confederation, and the Constitution–ran for the presidency? Could Roger Sherman win at age 67?